Join us to raise awareness and have some fun! Legs Out for Lymphoma is our signature event to raise awareness of lymphoma. Will you be part of a team this year? Register now to walk with us! It's FREE to sign up! Legs Out for Lymphoma is a fun community event where participants unite together and walk a short course (approx. 5km) to raise awareness and raise funds for specialist Lymphoma Care Nurses. By participating in one of our national walks, or by organising your own activity, challenge or event, you will help us place specialist Lymphoma Care Nurses around the country, who will help to take the fear out of a lymphoma diagnosis. Join us and help reach our goal to fund Lymphoma Care Nurses across Australia & unite together in the fight against Lymphoma! Get involved, get fit and get fundraising for this worthy cause. Virtual walk - at your own time and pace, wherever it suits you! 2017/18 Legs Out - THANK YOU! Thank you to everyone who was involved with Legs Out for Lymphoma in 2017-2018. The funds you raised (more than $85,000!!) will support Lymphoma Care Nurses who are providing patient support services to ensure no one is facing a cancer diagnosis on their own. Enter your details below to receive updates on our next walk event and other Lymphoma Australia news and updates. "One on one contact with a specialist nurse gives you confidence in their experience and offers compassion for what you are dealing with every single day. 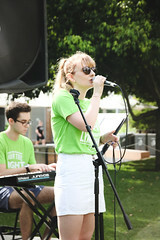 Lymphoma Australia needs our support - it is the only lymphoma exclusive charity available to patients and their families. I found this nurse service invaluable." If you can't make one of our walks you can still participate virtually or set up your own event. Simply register as a 'virtual fundraiser' to complete as many KM's as you can and get your friends and family to sponsor you. Every dollar you raise will make a real difference.